Security risk? Israel lets Arab medical staff with PA plates drive in from Judea-Samaria, has PA police guard entrances to Jerusalem. In a move likely to raise security concerns among many, Israel began Tuesday to allow Palestinian Arab medical staff working inside the 1949 Armistice lines to freely enter from Judea and Samaria with their own vehicles, a first in 15 years since the outbreak of the last major terror war from the region. COGAT (Coordination of Government Activities in the Territories) said it had "approved for Palestinian doctors who work shifts and other jobs that require heightened responsiveness in hospitals in Israel to enter Israel with their vehicles." Permits are being issued immediately according to the COGAT statement, reports AFP. This is the first time that cars with Palestinian Authority (PA) plates will be let in since massive terrorism forced a change in policy. "For the first time since 2000, Palestinian vehicles are entering Israel," COGAT said, adding that the move was aimed to "assist doctors in completing their life-saving mission." In 2000, arch-terrorist and then-PA chairman Yasser Arafat launched the Second Intifada or Oslo War as it alternately come to be known, a campaign of terror attacks targeting Jews in all parts of Israel that inflicted massive casualties. To block the easy influx of weapons and bombs over the 1949 Armistice line, cars with PA plates were banned from freely entering from Judea, Samaria and Gaza. A spokesperson confirmed the decision was made for "national security reasons." 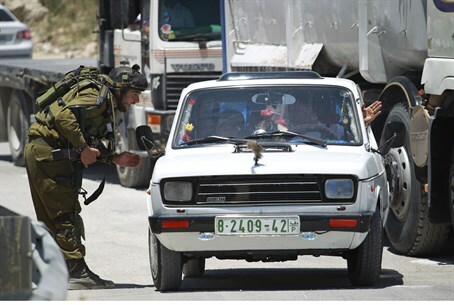 Likewise vehicles with PA license plates are prohibited from using roads under Israeli authority in Judea and Samaria, to prevent attacks. And while the terrorism has certainly not gone away in Judea and Samaria since 2000, with last year featuring a Hamas coup attempt in the region and numerous terrorists from the area causing Jerusalem in particular bear the brunt of high-profile attacks, Israel has decided to ease the security restrictions. Apparently in an attempt to deal with the increased threats that will inevitably follow the move, Israel is increasing the presence of forces near the entrance to Jerusalem - with PA officers. On Thursday, PA Security Forces were deployed for the first time in three areas of Judea and Samaria near eastern Jerusalem, in an effort to target criminals and would-be terrorists in coordination with Israeli security forces, officials on both sides said. That came despite a PA threat to end security coordination with Israel, after the Jewish state responded to the PA's unilateral International Criminal Court (ICC) bid to sue Israel for "war crimes" by withholding tax revenues collected for it earlier this year.